Here are six ways to grill fall produce, from sweet potatoes to mushrooms. Summer may be over, but grilling is still in season—just ask grilling guru chef Tim Love. He believes nearly everything can benefit from some time on the fire. To prove his point and inspire you to get back out there and grill some more, here are six ways to grill fall produce, from sweet potatoes to mushrooms. 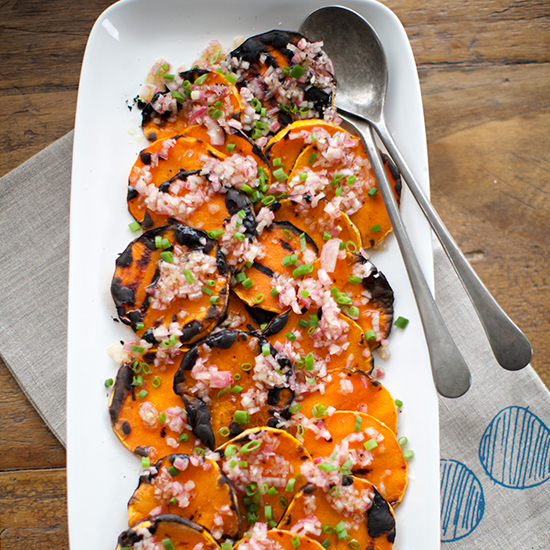 Butternut squash tastes like a whole new vegetable when grilled—crisp, bright and not overly sweet. Grilled whole, these coral-like mushrooms become crispy outside and meaty inside. These charred sweet potatoes are delicious in a warm salad with escarole, pineapple and bell peppers. Figs need just about four minutes on the grill before they get lightly charred and juicy. This is the perfect salad for harvest season. It’s made with nearly bursting green grapes, meaty oyster mushrooms and bitter, crunchy celery. Grilling turnips brings out their delicious sweetness.